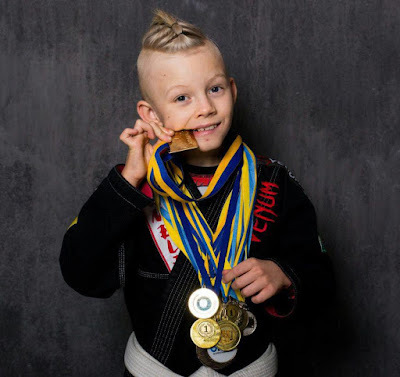 Jiu-jitsu.News: What do young Ukrainian athletes dream about? “My dream is to become an UFC champion”, – wrote on his page in a social network, Bogdan Anikanov from Kherson city. In his early 10, Bogdan has already become a champion of Ukraine in Brazilian Jiu-Jitsu, and won the title of the most physically trained child of his age. In 2016, Bogdan participated in dozens of tournaments, considering the fact that he started to do Brazilian Jiu-Jitsu and grappling only in 2015. “It turned my life upside down. For such a short period, in terms of sports, he achieved such a great results”, – said Bogdan’s father Vladimir Anikanov. The champion title of Mykolayiv and Odessa regions in BJJ, GI. Before involving in Brazilian Jiu- Jitsu, Bogdan hasn’t been engaged in any kind of sports. At first, he trained three times a week for two hours a day, and now he increased training time to six times per week. “At the start, trainings were difficult because I was the smallest one in my group and weighed about 25 kg, while the other children were about 32 kg. But over time I got used to train with heavier rivals. Perhaps, this factor greatly helped me, since at competitions I fond easier to fight against sportsmen of my weight category”, – noted Bogdan. According to young athlete, he enjoyed practicing Brazilian jiu- jitsu and grappling, but his passion is MMA. “My coach Artem Golovko is a role model and the best example for me, and as for my favorite fighters they are Khabib Nurmagomedov and Conor McGregor”, – shared Bogdan.